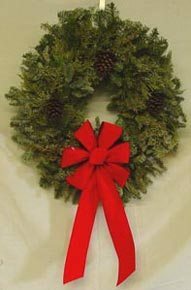 The balsam wreath is decorated with three pine cones, red velvet bow with 6 loops, and Red holly berry clusters. Available in 22", 24", 26" and 32". 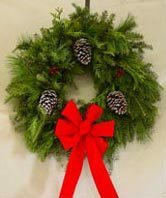 The Fraser Fir wreath is decorated with a red velvet bow, three pine cones and red holly berry cluster. 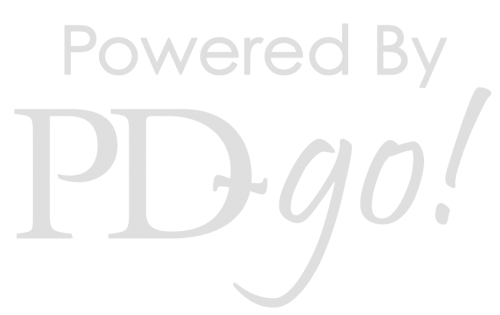 Free wreath hanger with each wreath ordered. Your choice of a 24" or 36". 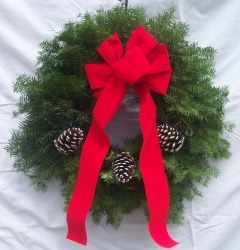 Our most popular wreath is decorated with three pine cones, red velvet bow with 6 loops, and Red holly berry clusters. Available in 22", 24", 26", or 32". 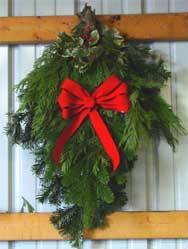 Beautiful arrangements of greens approximatly 30" long consisting of Noble Fir, incense cedar and juniper with a beautiful velvet bow.